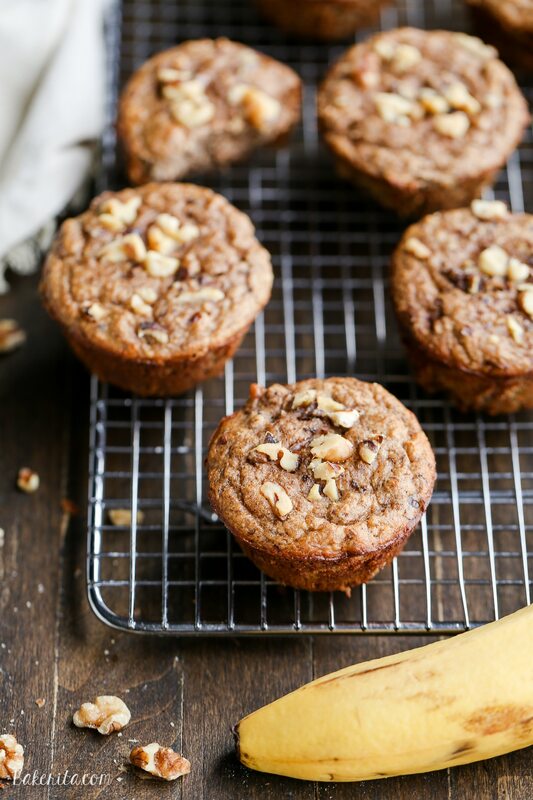 You would never guess that these Paleo Banana Nut Muffins have no added sugar – all the sweetness comes from the bananas! These gluten-free muffins make a great breakfast or snack. Happy Monday! This past week was a weird one for me, and I’m looking forward to this week’s fresh start. Monday, and muffins, are being embraced whole-heartedly. I’ve been battling a pretty bad cold for the past week, and it’s left me exhausted, coughing, sneezing, and worst of all – uninspired. Finally, on Thursday and Friday, I just let myself be sick. Stopped trying to brainstorm recipes when I didn’t even want to think about food, took a nap in the middle of the day, and let myself do just the work that I needed to – no more. It paid off, because Saturday I woke up feeling reenergized. Still coughing and sneezing a bit, but also totally antsy to get out of my apartment. I took a walk and ended up three miles down my street at my new favorite acai bowl place, my mind swirling with ideas and a iPhone note with a list of recipe titles. I got my groove back. Despite my sickness, I did have one recipe success last week: these paleo banana nut muffins, and they were a major hit, if I do say so myself. I had written this recipe up before I got sick and I ended up making them midway through the week when I majorly needed a pick-me-up. Thankfully, they only take a few minutes to get into the oven. The cinnamon makes the everything smell so warm and comforting while these are baking – I could even smell it through my stuffy nose! 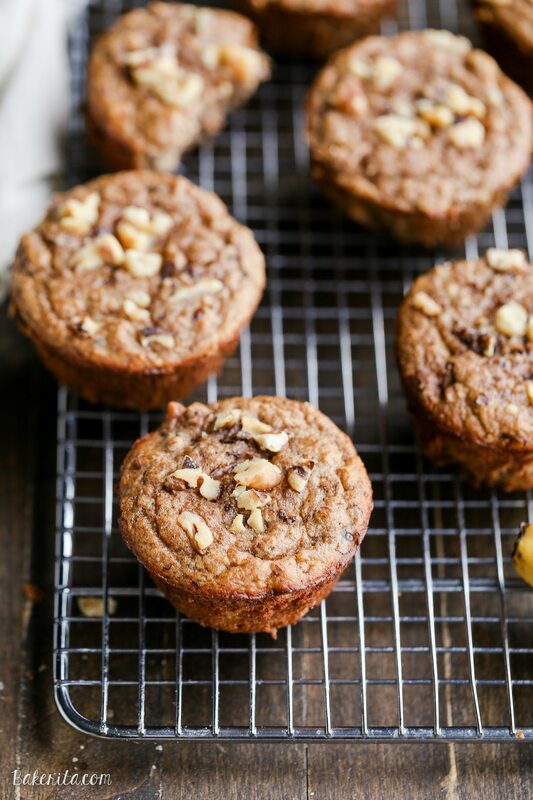 This banana nut muffin recipe is adapted from my paleo chocolate chunk banana bread, which is one my favorite recipes and the all-time most popular recipe on my site! It’s a winner, for good reason. Like that bread, these muffin have NO added sugar. None. All the sweetness here comes from your ripe bananas, so make sure you let them get nice and ripe. The darker and spottier, the sweeter your muffins will be! The only flour these use is coconut flour, and you can’t sub anything else! Coconut flour is uniquely absorbent and no other flour will match the texture you get from using coconut flour here. I opted for walnuts as the nut, which I feel are fairly traditional for banana nut muffins, but feel free to sub whichever nut is your favorite (or whatever you have). Pecans would be delish! You could also toss in some paleo chocolate chunks if you like a little chocolate in your muffins. These muffins smell amazing coming out of the oven, and they taste even better! They’re sweet enough even without the sugar, allowing the banana flavor to shine. The texture is spot on fluffy, and the toasted walnut add a little extra crunch and warmth. I quickly devoured one, and I’m wishing I still had a few left! These are a real treat, whether it’s for breakfast, a snack, or a welcome lunchbox addition. Happy baking! 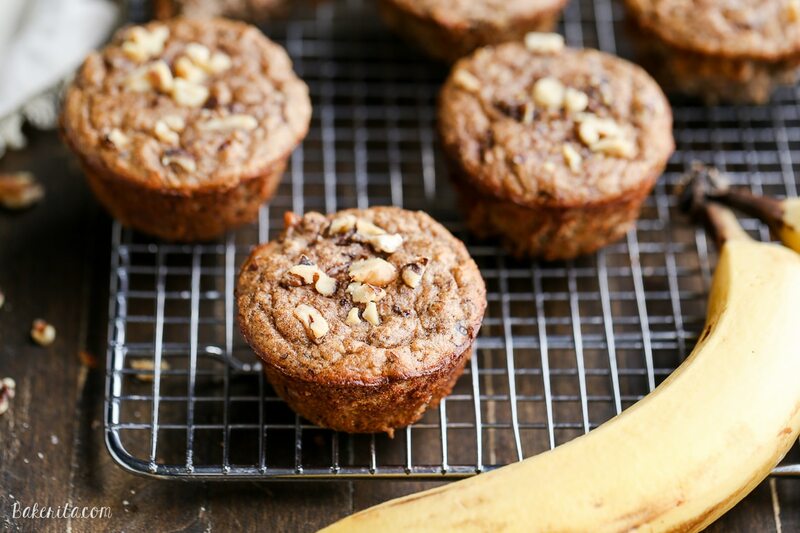 Mondays definitely call for muffins, especially when bananas are involved! These sound so delicious, Rachel! I love that there is no sugar in here. Sounds just perfect, especially with that fluffy texture! Thanks Sarah! I’m still sneezing a bit, but better for the most part thank GOODNESS! :) I hope your mom loves the muffins! Rachel, would it be possible to sub peanut butter for the almond butter? Hi Sara, yes definitely! Any nut or seed butter should work well here. No added sugar and no artificial sweeteners? I’m in! I love how there are lots of bananas – 3 or 4, not just one :) The banana flavor will come through for sure – mouthwatering! I’m glad that you are feeling better!! And these banana muffins sound just perfect – I love that there’s no added sugar! Oh these are happening. How many times have I told you I love your gluten free recipes?? I love that these are also dairy free! We aren’t, but I’m often cooking/baking for people with allergies so I NEED these simple allergy friendly recipes in my back pocket. I could happily start my day with these muffins! Love the banana nut flavor!! I just love your paleo recipes! Happy you are feeling better! I have some coconut flour that I need to use up as I never really like using it in my bakes, but I have a feeling it will work well in this recipe! Yum – I’ve got 4 bananas almost ready on my bench to make this! Do you think you could add in some blueberries without changing the liquid ratio too much! Thanks! Hi Ashleigh. You can definitely add some blueberries! Enjoy. Oh no, sorry to hear you were sick. Hope you feel better soon, Rachel! Something is definitely going around, we finally got better after 3 weeks of being sick too. These muffins hopefully help make things better! Love that they are paleo – they look perfect! Being sick is the worst :( thankfully I’m on the upswing! Thank you Kelly! I kind of know what you mean…last week kicked my tail so I was ready for a fresh week! These muffins look AMAZING! I’m sorry your sick! Colds are the worst, but there is nothing like fresh warm from the oven muffins to perk up your mood. Rachel, Have you tried making these muffins with egg replacer? I am not able to eat eggs and because of digestion problems am trying to avoid wheat. Thanks. Hi Vergie, no, I haven’t tried these with an egg replacer. You can try it though! 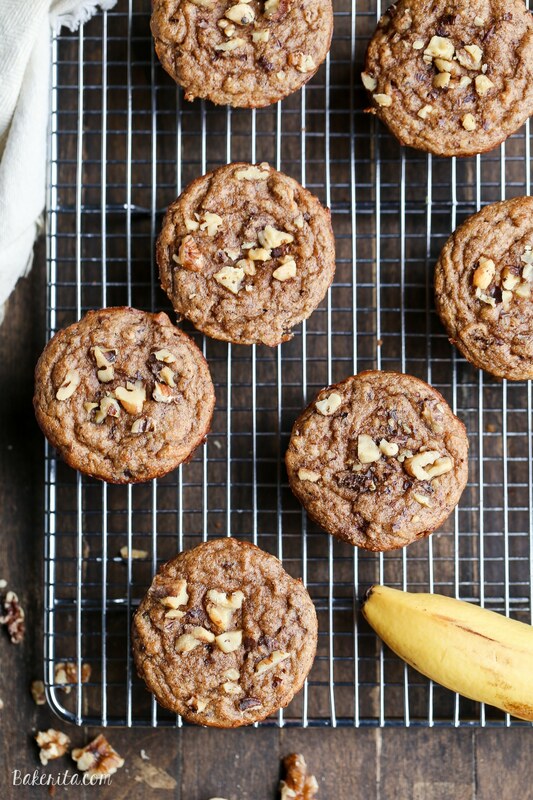 I love flourless muffins, and banana is always a favorite here! I have everything I need for these and am making them this week! Oh no, I hope you feel 100% better soon. Being sick is no fun. Our entire family has been battling the flu on and off for the past month. Having these muffins around would definitely make everyone feel better though. I love that they are paleo and have no sugar! I can’t wait to make these! Ugh, we all have the cold this week. Feeling so wiped out! I need to rest up like you did and get better asap. These muffins look amazing! Can’t believe they’re paleo! My co-worker and I were just talking about how difficult coconut flour is to bake with… You have to use A LOT more liquid! So happy I stumbled across this recipe. Can’t wait to try it! I was literally thinking I should make some banana muffins for breakfast this morning. Bakerita for the win!! Wow these are good! Fluffy and crunch with just the right amount of sweetness from the bananas. I will definitely be making these on a regular basis! I had to bake mine for a bit longer than the 19 minutes stated in the recipe – it was more like 22-24 minutes for me before the toothpick came out clean. But I have a finicky oven, so I’m not surprised. Just made these to try as I will be doing a 6-week fitness challenge which will also be following a Paleo diet. Only thing I did differently was to sprinkle 4-5 chocolate chips on each muffin and omit the nuts. Sixteen minutes and they were perfect! Will definitely do a mix of nuts and chocolate chips next time as I think I would have enjoyed the crunch of the nuts. Question for you…do you think I can substitute liquid egg whites for all or part of the eggs? Yumm, these babies just came out of the oven! How long do these stay fresh? Have you tried freezing them? I would like to take them to work for breakfast. Hi Claire! They freeze really well. I’d stay they keep fresh for about 2 days stored at room temperature, and they’ll keep in the fridge for about 5 days. Hope this helps! So glad you’re loving them Kathryn! I haven’t calculated the nutritional info for these, but you can do so here by inputting the ingredients: http://www.myfitnesspal.com/recipe/calculator. Enjoy! This is literally the first coconut flour paleo recipe that I’ve made that I have not thrown in the trash can! These are seriously so good thank you! I will definitely be looking and making your other recipes! I’m so happy to hear that, Jen!! :) I hope you love all the recipes that you try. First attempt at baking without”flour” … was worried it would be strong coconut flavour – was sooo wrong! I actually followed recipe (except no walnuts – only cause I didn’t have any in my cupboard!). These were absolutely fabulous and will make again but with the walnuts! I’m pretty excited to try more of your recipes!!! Hi Rachel- great recipe, thank you! I was wondering if you had the calorie count to it, just curious! Hi Malihe. Unfortunately coconut flour is much more absorbent than wheat flour is so it would require a lot more wheat flour to make up for the coconut flour. Since I haven’t tested it this way, I’m not sure how much it would take. Sorry! Hey these look amazing!! I’m just wondering if you can freeze them? Hi Ashlee – yup, they freeze really well! Just make sure they’re tightly wrapped to avoid freezer burn. These muffins have a great texture and flavor. I only had two bananas so I used applesauce (no sugar added) as well. Thank you for creating and sharing this amazing recipe! I’m excited to try more of your recipes. I’m so glad you enjoyed it Grace! Thanks for sharing your changes – glad to know that substitute worked out well. Hope you find lots of recipes you love! This recipe looks delicious! Going to make these this weekend! What is the nutrition facts for them? Hi Lauren, you can calculate the nutritional facts here: myfitnesspal.com/recipe/calculator. Enjoy! Can I make these with all-purpose gluten free flour? Would I need to change any of the measurements? Hi Robin – coconut flour is uniquely absorbent and no other flour can be subbed 1:1 for it. To use GF AP flour, the recipe would need to be reworked significantly, pretty much into a new recipe. I’d recommend getting your hands on some coconut flour. It’s pretty cheap and a little while last you a while! Thanks! Just picked up some coconut flour. Can I sub butter for coconut oil? Not a huge fan of coconut oil taste. You can use butter, but in the future I thought I’d note that you can buy refined coconut oil – it’s had the coconutty scent and flavor removed from it. Enjoy the muffins! Hi Danielle – the batter for these should be relatively thick and not liquidy, since there really is no liquid in them besides the small amount of melted coconut oil. Is it possible you misread an ingredient or missed something? The coconut flour should definitely help thicken the batter up, too. Are there any changes you made or anything? I’d love to help you figure out what went wrong – I know how frustrating it is when a recipe doesn’t turn out! Hmm, definitely didn’t miss anything but I live in high altitude so maybe that has something to do with it. It just seemed like it needed more dry ingredients. I wound up cooking them for about 25 minutes longer and they shaped up a bit so in the end, they were ok – I guess I will add more flour next time? That was going to be my next question! I’d try adding extra coconut flour until it’s thicker – just add about a tablespoon at a time, stir it in, and wait to see how thick it gets after a little bit. Add more if you need to. I hope they still ended up tasting good! Hi Samantha, I just updated the recipe card with the nutritional info. 187 calories per muffin! Check out the recipe card for the rest of the info. I just came across this recipe and will make with my girls when they wake up from naps. I have lots of ripe bananas to use up. I’m glad there is no other sweetener added, so not necessary when using super ripe bananas. I never notice that these are lacking sugar! I hope you and your girls love them and have fun making them, Lane. This will sound like an odd question but are these full sized muffins or mini? These are full sized muffins! If I make them mini’s will anything change other than the time baked? Nope just bake for a shorter amount of time and you’ll be good! Enjoy. I don’t like almond butter. What can I sub in for almond butter in this recipe? You can use any nut butter that you enjoy, or sunflower seed butter or tahini. I just used sunbutter in this recipe, and discovered a funny reaction between baking soda and the acid in the sunflower seeds, which turned the muffins a dark green/ black color. Too bad it’s a bit late for Halloween! They are still delicious. Hi Shelley, Sunbutter can tend to do that when there’s baking soda in there. Glad you’re still enjoying them though! The same thing happened to me, too! I was pretty horrified until I did a little research. The green is caused by a chemical reaction between the chlorophyll in the sunflower seeds and the leavening agents. It’s perfectly safe to eat. If the green color is bothersome, apparently you can add a little lemon juice (1-3 teaspoons) to the batter and this will help. OR you can add a touch of cocoa powder to mask the green. So glad you’re loving the muffins, Juli, and thanks for sharing the info about using sunflower seed butter. It can be scary and off-putting when you don’t know that it’s totally natural for that to happen. Enjoy! Is peanut butter fine? As I don’t have almond butter..? Yup any type of nut butter will work! My first batch came out a bit too moist. The next time I added one more tablespoon of coconut flour and they were just right. Made 24 mini muffins for a party and got compliments! So glad you enjoyed them, Tippi! Thanks for your feedback. For me the batter wasn’t thick. Had to cook much longer. Will add more flour next time, perhaps closer to the amount in traditional recipes. Thanks for sharing. Hi Tim, you can try adding coconut flour about a tablespoon at a time until you get to the right consistency. Sometimes brands can vary in absorbency levels, but it’s easy to add too much! These were delicious! My daughter is not a huge banana fan so they didn’t rate as high on her scale- but beyond the banana, she loved them. She is a runner and I am always looking for heathy, protein and potassium rich snacks. We loved the light, fluffy texture. Next time, I plan to add some chocolate chips. Thank you! Having one for breakfast this morning! So thrilled to hear you’re enjoying them, Dee! For your daughter, you could sub in some applesauce for the banana to make them less “banana-y”. Chocolate chips sound like a great idea. Enjoy! I tried the applesauce and my family really enjoyed them. I thought they were missing something but I made the recipe with organic canned sweet potatoes yesterday and they were delicious. I am thinking I just didn’t put enough cinnamon in the apple version. This is a great base recipe- substitute the banana for a variety of other items. Pumpkin is next!!. The banana is still my favorite but sweet potato is a close second. Thanks again. Mmm sweet potato sounds amazing here! So glad you’re enjoying the muffins and having fun experimenting with them :) it’s definitely a super versatile recipe! These are fantastic. I’ve made (and eaten) two batches already and still can’t believe that they work! They freeze well and keep in the refrigerator JUST like you said. Amazing. That being said, I feel SO much better about putting these in my body than I would something from a pouch. Thank you so much. These are a game-changer! I’m so thrilled to hear they’ve been a hit with you, Tina! Thanks so much for sharing your feedback with me. Wow. I had 4 bananas that I didn’t want to waste, but didn’t really want to eat either — way too brown! I googled for paleo banana muffins and this recipe came up. It was simple enough and I had all the ingredients, so I gave it a shot. WOW! Are these good! One of the best paleo muffins I’ve eaten. Thank you! We just loved these! Same here!!!!! First thing that popped up when I googled lol. Soooo good! I did have to cook mine longer to get them done, but again all ovens are different! Loved them! Thanks for this! These were great! Bear in mind that the banana ripeness will directly affect sweetness – I used bananas that were just starting to get spotty (instead of super ripe blackened bananas) and ended up with a very lightly sweet muffin. If your bananas aren’t super ripe you could try adding a few dark chocolate chips or add more cinnamon and vanilla to amp up the other flavor components. The texture was very good and definitely had a more traditional muffin crumb compared to other grain free muffins I’ve tried. Thanks so much for your feedback Danielle, and for the helpful tip about the ripeness of the bananas – that’s definitely true. Glad you’re enjoying them! Super YUMMY easy to make. I baked them 20 min. So glad you enjoyed them, Anne Marie! I tried this recipe today, a snowy Thursday in February after my 90 yr old Mom requested muffins. I’ve been trying the Memory Repair Protocol with her, but it’s rough going because she wants her familiar grainy cheesy foods. Anyway, I couldn’t find paper muffin liners so I used silicone ones, and what a mistake that was! They came out too moist, more like banana nut custard even though I baked them 2-4 minutes longer, and they stuck to the silicone. Next time I’ll follow the directions and use paper liners. I added a few tsp lemon juice to the bananas when I was mashing them, and added 4 snipped up dates. Mother has a major sweet tooth and I added the dates just in case the brownish bananas weren’t sweet enough. Maybe my homemade coconut flour wasn’t finely ground enough? Did mom like them? YES! Hurray! The only qualifier was that she would have preferred it to be served warm. I think the moistness makes it have a colder mouth-feel when fully cooled. Hi Charlotte, sorry that you had trouble. I worry that the added lemon juice and dates could have also caused the muffins to be too moist. Also, homemade coconut flour? How did you do that? I haven’t heard of it, and I wonder if maybe it’s not quite as absorbent as store bought coconut flour. So glad they were still able to be enjoyed by your mother, though! Hello from Greece! My daughter loves these muffins! Have you ever tried making them in a silicone cake mould? I wonder if it is possible. Hi Vanessa!! Jealous you’re in Greece – such a beautiful place! I haven’t tried making in a silicone cake mold but I don’t see why it wouldn’t work – just adjust the bake time based on the size of the mold. Enjoy! Thank you Rachel! I will make an attempt and let you know. I’ve never commented on a recipe before, but these muffins are delicious! Just made a batch tonight. I didn’t want to use up all of my (pricey!) humanely- raised eggs in a recipe, since doubling it would have required 6 eggs, so I subbed flax eggs for part of it. I doubled the recipe and used 4 flax eggs (1 TBSP flax meal + 2.5TBSP water per egg, sit for 5 minutes) and 2 regular eggs and it tasted great. We did whole30 in January and I loved these muffins during that time (minus the vanilla extract then). ;) Continuing to make them after whole30 as a healthy breakfast alternative that still tastes yummy! These are just so so good. 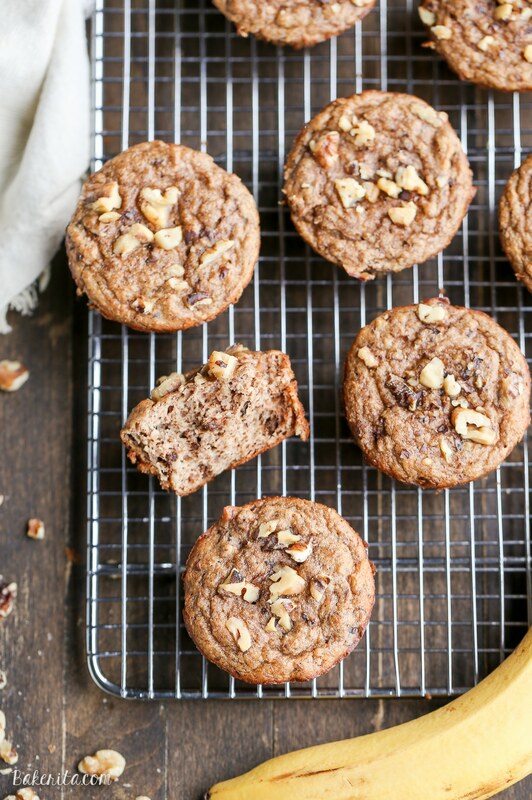 I have tried all the banana nut muffin Paleo and whole30 recipes, and these are BY FAR the best. Thanks so much for sharing! That makes me SO happy to hear, Carrie! Thanks so much for the kind feedback :) I appreciate it so much! I just made this recipe and wow!!! So good! So glad you’re enjoying them! Thanks so much for the feedback Sarah. These sound amazing! Do you think I could add collagen peptides to up the protein? If so, would I need to change any other parts of the recipe? Hi Mandy, yes you totally could, and no need to change anything else! :) Enjoy! I just baked these – gorgeous! Perfect segue out of Whole30. How would you recommend storing these? In the fridge? Also, I’m thinking they would freeze well, do you? Would love to cook up a large batch for easy breakfasts. Thanks so much! Hi Natali – they’ll last the longest in the fridge or freezer! They freeze wonderfully – I prefer to freeze them in a Ziplock or an airtight container and then pop on in the microwave to defrost when I’m ready to eat (then I have a nice warm muffin, too!). So glad you’re loving them! Enjoy, and thanks so much for your feedback. I’ve left it in the oven for an extra 10 min. Still soggy. Help please. Hi Sue, did you make any changes to the recipe? Many people have made this recipe with success and I’ve made it MANY times so not sure what could’ve gone wrong unless you changed something. It’s hard for me to know what went wrong with no info. I didn’t change the recipe other than omitting the nuts. I left it in the oven for an extra 20 min (approx) and then they were fine. I made these. I added a little stevia just for some added sweetness. They were BOMB. I sprinkled some chopped pecans on top before I baked them. I used butter the first time but I’ll use coconut oil next time as I am trying to avoid dairy now. I am so glad these don’t have almond flour as I am not a fan of that. I have found that a bit of almond butter works soooo good in coconut flour baked goods, and this is no exception. I’ll be making these forever. Nice to have a dessert type of food to turn to while I am trying to heal my stomach issues. They don’t make me feel bloated or full, and do not cause a flare in intestinal Problems. The kids love them too! These are soooo good!! I use sunbutter and they somehow do not turn green as others have reported. They do freeze well. I prefer to eat them cold. Thanks for this great recipe! I just made it for the third time. I made these today. Used your peanut butter suggestion. They are delicious! So glad you’re enjoying them, Mike! So thrilled you’re loving them! Thanks for the feedback, Tina. Recipe perfect, results delicious! I LOVE that there is not an ounce of added sugar in it, yet they came out perfectly sweet. This is my new go-to recipe for banana muffins. Thanks for sharing! So glad you’re enjoying them Niki! Thanks so much for your feedback. Made these last night and was blown away by how fabulous they were!!! What a gem of a recipe. Will be making them again and again for sure. Only problem I had was that they really stuck to the wrappers. Thinking about greasing muffin tins with coconut oil next time and seeing how that goes. Thank you so much! Hi Elisa, so glad you enjoyed them!! My favorite liners to use are the parchment paper ones from the brand If You Care – I find that nothing sticks to them and they’re available at most grocery stores :) greasing the tin always works well for these. Hope this helps for next time! Just made a double batch of these in my jumbo muffin tin. Had to bake them a lot longer because of the larger size – about 30 minutes. I used pecans instead of walnuts. I also didn’t use muffin liners, just used coconut oil spray. They popped right out after cooling for about 10 minutes. My husband and I just each ate one. They are SOOOOOO good!!!! Great texture, lovely banana flavor, just the right sweetness. I am new to paleo baking, but honestly I don’t think I’ll ever go back to using regular flour and dairy. These are BETTER than non-paleo muffins. Who knew?!! I can’t wait to check out your other paleo recipes! I made these once and absolutely loved them, I’ve been trying to find this recipe again for over a year and am so happy I found it again! I will be making these ASAP!! So glad you love them and were about to find them again, Kendra! * I started this recipe thinking I had 3 eggs when I only had two, so I subbed the 3rd egg with a flax egg (1 Tbs ground flax to 1 Tbs water). I will try this recipe again with three eggs and I’m thinking the bake time will decrease for me. I feel so good about my kids eating these. Thank you! Love your blog. I’ve made these a couple of times now and I’ve mixed up the add-ins. Blueberry walnut and I just made some mixed berry no nuts (out of walnuts). Hubby loves them. I make a batch on the weekends and have them for our weekday breakfasts. So good and store fine in the fridge! Thanks for creating this recipe! So thrilled to hear they’re a hit! Love your combinations – those sound delicious. Thanks so much for the feedback! Just made these and they are delish! I’m going to have to hide some for myself because the rest of the family is eating them fast! I’m not big on walnuts, so I added dairy free chocolate chips instead. They are moist and quite fluffy for coconut flour. So thrilled to hear that! Sounds great with chocolate :) Thanks for the feedback, Shannon! These are hands down the best healthy muffins I’ve ever had! The texture is perfect and they are really delicious. I will be making these again. Often! Hi Alix, yes these are not meant to be made without eggs. I wish you would’ve reached out sooner! This muffin recipe was developed without eggs, and you can leave out the coconut & sub macadamia nuts for your favorite nut to make a version of these banana nut muffins that is egg-free. Hope this helps!